Magic Pendulums: Masterworks for Mystery Performers is HERE! 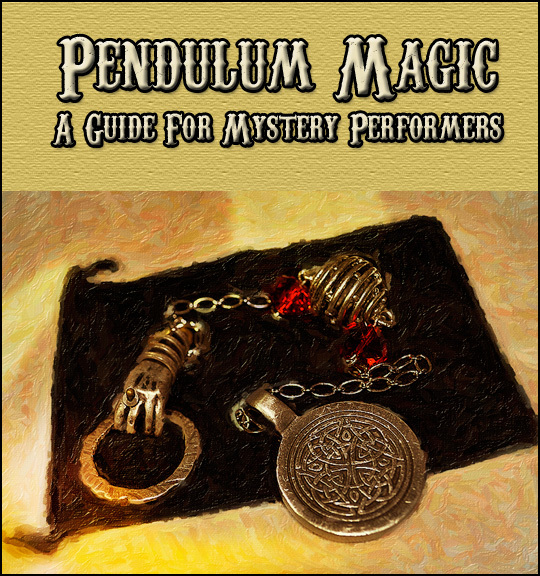 This is our third Magic Pendulums eBook. The routines have been handpicked from the working repertoires of some of the most respected names in mentalism. Each routine has been chosen because it is proven in front of live audiences...and each one is unique and ONLY available in this eBook. In the chosen routines, there aren't any deadly difficult lists to memorize. No complex mental calculations. No knuckle-busting sleights to master...just routines that leave you free to concentrate on delighting, amazing and entertaining your audiences. Richard Osterlind wrote the Foreword to the book. In it, he addresses two questions: "What is Mentalism from a performer's perspective? and "What is mentalism from an audience perspective?" If you're familiar with Osterlind's philosophies on performance, you already have a good idea of where he stands. But in this essay, he goes deeper into where HIS mind is at when he's entertaining Fortune 500 companies or his other clients around the world. You may agree or disagree with what he has to say -- but I guarantee you: what's here will make you think. Bob Cassidy has written the Introduction. In this, he shares some history on pendulums -- but he also shares his favorite pendulum effect. We were honored that he would do this...and utterly delighted with what he sent. This effect is very simple to perform and WILL leave your audience wondering if you can actually use your pendulum to read their mind. Clear, concise and brilliantly designed -- this intro starts you off with a powerful routine and some wonderful information. Neal Scryer is one of the hottest names in mentalism today. Author of classics like "Neal Scryer and Friends" and "Carnival of Secrets," Neal sat down and designed a routine specifically for this eBook. It's entitled "Masterpiece" and, with it, your pendulum is able to uncover a drawing/thought/location written by a spectator and immediately sealed in an envelope. This is a routine I've performed personally -- and the ease with which it is performed is WAY out of proportion to the slack jawed astounded look on the collective audience face. This is a gem you WILL use. Luca Volpe truly is one of Italy's treasures. He offers a chilling routine featuring a very, very bad man and three very, very unlucky girls. Throughout this routine the pendulum is in the hands of a member of the audience. Did you get that? I mean through the entire routine! This is a murder mystery, a mini-seance and a masterclass in how to use pendulums -- all in one routine. Dark Night will chill you and make your audiences remember what they saw at your show. TC Tahoe offers a packed routine in the bittersweet-and-seriously-spooky routine entitled "Drinking the Moon." The story? An old crone in the backwoods agrees to teach a young boy REAL magic. It involves a strange pendulum, tarot cards and a story that will utterly captivate your audience. 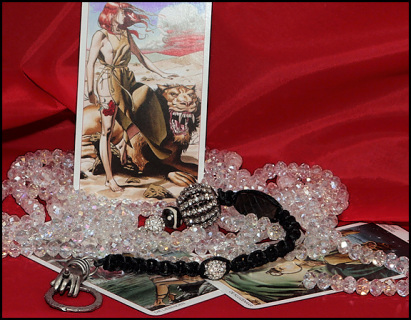 TC, who you may know for his extensive work with tarot cards, has also included a prime on how to "read" the Major Arcana for the purposes of this effect. This is hugely valuable to readers and non readers alike. This is a wonderful routine...utterly wonderful. Joe Leo is a mentalist and bizarre performer living and working in New York City. If you've been looking for a routine that includes a tension packed hunt for a serial killer, a pendulum wielding psychic detective, a Q and A and a killer introduction to a great book test like Luna (and who hasn't?) "A Test of Time" is for you. Joe offers step by step instructions, all the graphics you'll need and a storyline that will take your presentation to new heights. Joe's one of the most innovative thinkers in mentalism today and what he's sent could easily play into a very intimate memory-making hour long show. Pablo Amira may just be one of the most experienced pendulum workers on the planet. We were delighted when he offered us a stellar routine called "Pendulum of the Tarot." This is much more than a routine. It's a reading and presentation system that is SO good you may want to do away with the "punch-in-the-gut" ending entirely...although I wouldn't advise it. A truly wonderful effect where a card freely chosen by a spectator was..well...what you KNEW they'd choose all along. How? Simple. The pendulum told you. I was delighted when my friend, Neal Scryer, asked me to send one of my pet routines to him for publication in the classic Neal Scryer and Friends project. I sent him a true gem -- a worker I've been using for years. I titled it "Queen of Hidden Desire." The idea: a spectator secretly chooses one thing from a list of four options that really describes what motivates them...on the INSIDE. They seal this into an envelope, leave the other three choices face-down on the table, and the pendulum tells the performer which of the four choices they have made. The spiffy routine title comes from the fact that four queens from a deck of cards are used to represent the four differing desires. Dr. Bill Cushman has sent "Spin The Spook Spell" -- which is pure FUN. It's a wonderful self-working commercial effect that casts the mentalist in the role of a parent banshing the monsters from a soon-to-be-darkened room. I love this effect, personally. It's a brilliant re-tooling of some wonderful techniques that you could do on stage or close-up...for kids or adults. A really fun effect. Paul Prater is rapidly becoming one of the most sought-after designers in the business. Paul sent me his routine, wondering if it was "too dark." It's entitled "Dowsing for the Dead" and involves some boxes and a...well...a human finger. (Although Paul assures me that you COULD use a chicken bone instead....y'know...in a pinch.) The routine IS chilling. And it's dark...and it is going to leave an indelible impression on your audiences. And guess what? It's so easy to do that there is probably a law against it in Utah. 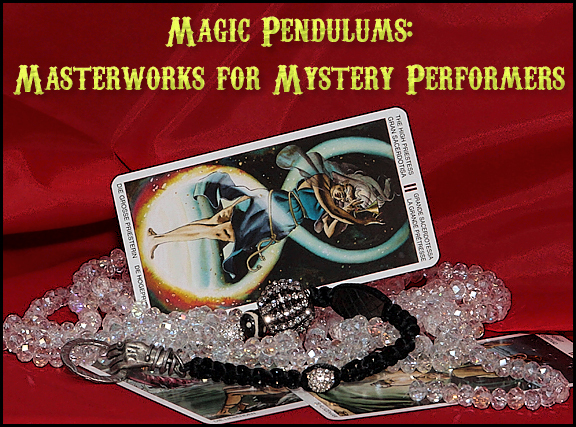 The number one question I get asked in email is how to best present pendulums to audiences. That's why I am closing this book with an essay on how to present your pendulum, how to choose the right volunteer and how to do a routine that will captivate the people watching. It's called "Putting the Magic in THEIR Hands." If you're new to pendulum use...even if you've performed with a pendulum before, I trust there's something here that you will use. The eBook is 100 pages long. This is the eBook ONLY.